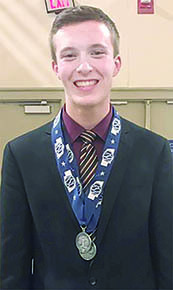 Boone Central senior Scott Wright, son of Doug and Michele Wright, brought home two medals from the state speech tournament held last Thursday, March 21, at the University of Nebraska at Kearney. Wright placed second in serious prose, as well as second in extemporaneous speaking. In extemporaneous speaking, a competitor draws a topic and then has one hour to prepare a five to seven minute speech on the topic. There are penalties for being under time or over time. 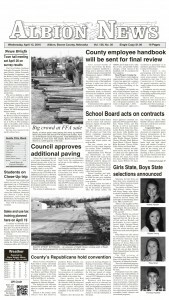 The topics are usually on a political or current events issue. In serious prose, Wright performed a cutting from the play, “So I Killed a few People,” by Gary Rudoren and David Summers. The piece is about a serial killer who is given the opportunity to tell his life story before his execution. The killer gives a chilling account of his first murder, providing an in-depth look at his true psychosis when he explains why the Disney corporation is truly to blame for his problems. Serious prose cuttings must be 10 minutes in length or less. Also qualifying for state speech was Stephanie Wright and Abby Mousel, who performed “The History of the World, I Guess” by Bill Wurtz in the event of duet acting.